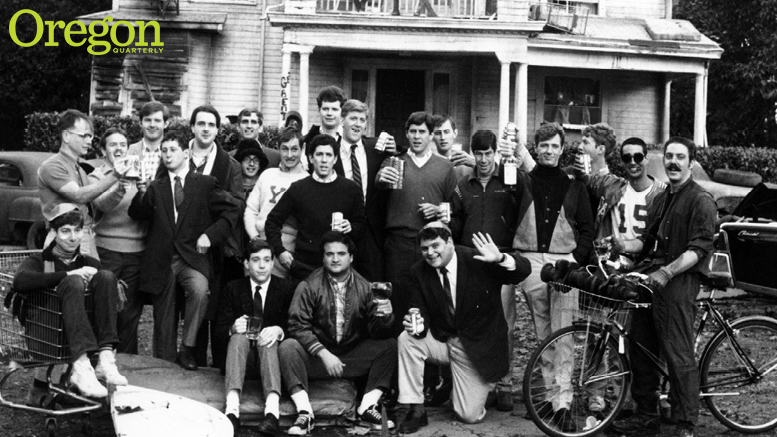 As a parent of a recent graduate from UO, I was very interested in the article regarding the 40th anniversary of Animal House [“Cell-UO-loid Heroes?” Summer 2018]. I and many others consider the movie a classic and applaud then president of the UO William Boyd for his controversial decision to allow the filming of the movie on campus, and even in his office. It is a movie that should be applauded by the UO family as putting UO on the map. I reject the quote from UO professor Michael Aronson, who says that as a film, “it’s best to forget.” The movie was funny at the time it was released and is iconic in movie history. I remind professor Aronson (for whom I have the greatest respect) that the US Library of Congress deemed Animal House “culturally, historically or aesthetically significant” and selected it for preservation in the National Film Registry. The movie was listed number one on Bravo’s “100 Funniest Movies.” It was number 36 on the American Film Institute’s “100 Years . . . 100 Laughs” list of the 100 best American comedies. I agree that there are scenes in the movie that, if shot today, would be deemed racist and sexist. Should we avoid movies from the ’40s that show everyone smoking? Or perhaps forget about The Godfather, because it shows Italian culture in a bad light? However, I agree with professor Aronson that it is hard to forget Otis Day and the Knights, a group that did not exist in “the real world” until the movie was released. Amazing what movies can do. Really?! This movie was a spoof/satire of its time. It cannot be judged by today’s values. Although incorrect for a number of reasons today, it should be judged by the standards of the time. I can watch it today and still laugh, and I don’t feel guilty. Political correctness is so much BS. Humor is basically cruel; something or someone is the object of a joke. To the author of this article: Get over it! It’s a pity the University of Oregon student culture, as depicted in Jason Stone’s article, has lost its sense of cultural history and humor. This must now be the “University of Political Correctness.” No wonder Jerry Seinfeld won’t perform on college campuses anymore. Jeez . . . LIGHTEN UP! I read with sadness your lovely tribute to Hope Pressman [Summer 2018, right]. Hope personified relationship-based development. We met when I was 13 years old and had a summer job in the UO development office, looking up phone numbers in the Eugene and Portland phone books (yes, the printed ones) because the university was getting ready to launch its phonathon fundraising program. Over the next 12 years, she would become a valued friend and mentor. My first “real” job after graduating from the UO in 1986 was to help raise $9 million in gifts to renovate and expand the main library. Hope initiated the idea to approach Phil Knight because of the important role Bill and Barbara Bowerman and Nike stock had played in the library’s growth to date. I was a 21-year-old junior development director, and with Hope and university librarian George Shipman (and others), developed the strategy, put together a proposal package, and planned the request that resulted in Mr. Knight’s multimillion-dollar gift to the library. Hope guided the work, smoothed the path, and ensured success every step of the way. She often didn’t get credit until much later for the big things she made happen at the UO. Her work was personal and often behind the scenes, not loud or flashy. She was a woman ahead of her time who didn’t call attention to herself, but shined a light on others and on the university’s accomplishments. Well done, good and faithful servant! The summer OQ was another great package of storytelling. But this Duck J-school grad would have been impressed with just three elements in the issue. My kudos contentions: (a) the photo and caption on page 15 [“Big Step Forward,” regarding a student from the UO’s Inside Out Program for incarcerated men, who graduated from a campus he had never visited] speaks volumes; (b) “On Her Own Terms” (Caitlyn Jenner) truly told the power of story; and (c) page 47’s Old Oregon cartoon mural was memorable for a ’64 grad (men’s hoops coach Steve Belko was my landlord my last two years in Eugene). Yes, that’s his caricature down by the old Mac Court. I just might have to buy a print. CORRECTION: Andrew Ek’s name and degree were misprinted in the summer issue. The 2017 alumnus (MS, conflict and dispute resolution) was included in a feature on entrepreneur Paul Anthony Troiano.